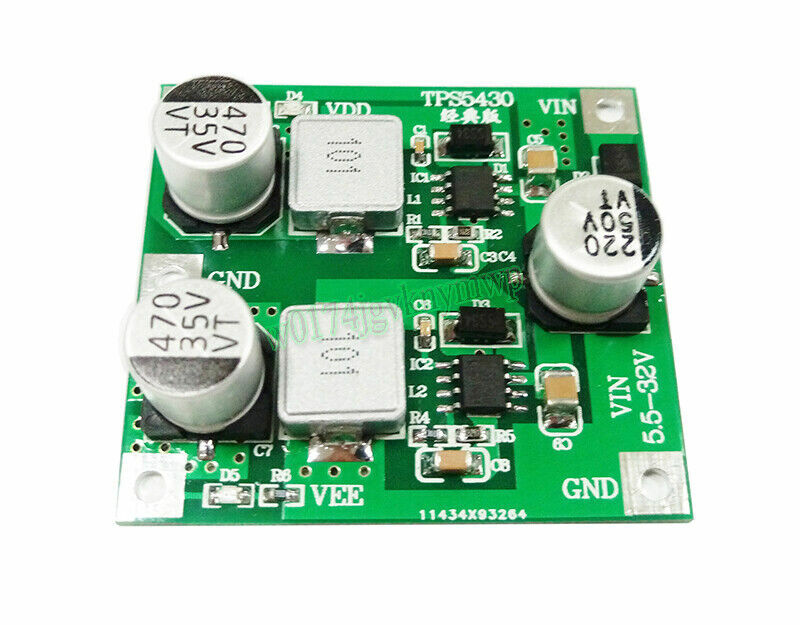 The TPS5430 positive negative power supply board using advanced SMT process, can be more easily applied to other projects in the secondary development. Tips: If buyer is familiar with this circuit (we do not provide technical support), it can also configure the output voltage by yourself. The configuration formula as follow: R2 = R1 * 1.221 / (VOUT-1.221) (positive voltage), for example, need +5V output, when R1 is 10KΩ, R2 should be allocated to 3.24KΩ. 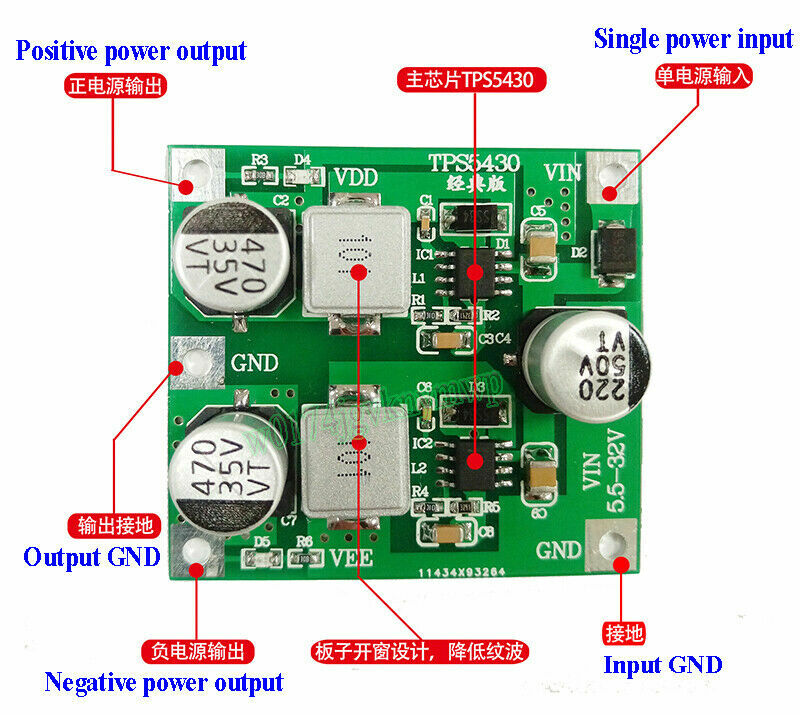 R4 = R3 * 1.221 / (VOUT-1.221) (negative voltage), for example, need -5V output, R3 is 10KΩ, R4 should be allocated with 3.24KΩ. just for your reference. We accept PayPal only, all major credit cards are accepted through secure payment processor PayPal. Please leave note for your special request (e.g. Colors or Size) in ebay when you pay the order. Item will be shipped within one business day after full payment is received. Except The United States and Russia we shipped use Epack, We ship worldwide with standard shipping by Hong Kong Air mail. This international order may take longer to arrive, Normally the shipment to worldwide is used to take 35 to 40 business days, exclude Sat & Sun.. 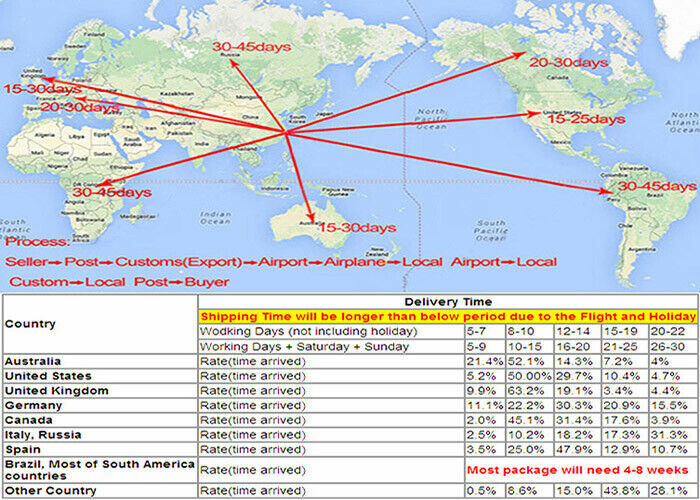 Delivery time depends on destination and other factors, if you still not received it in normal days. Please don’t worry, I hope you can give me a message before you do any action. Any feedback. We are committed to resolve all issues in a friendly and satisfactory manner. We always reply to ebay messages within 1-2 business days. If you do not get a response from us, then please check your ebay message. we only reply by ebay message, no send email. Dear buyers, we appreciate your business, if you are satisfied with our service, please leave me a postive rate, Your recognition will make us more confident to develop business and serve you better. Our goal is to make sure you are a happy buyer and pleasant shopping with us. Please give us ebay message before leaving any 1 or 2 ratings, neutral, negative feedback or open any dispute. We understand the concerns and frustrations you might have, and will do our endeavor to resolve the issues. Please give us the opportunity to resolve any problem. thank you very much! And hope to see you soon. If you have any questions, please feel free to email our service specialists 24 Hours a Day, and we will reply you ASAP. If no response within 24 Hours, please check the spam of mail box or kindly re-send it to us. We greatly appreciate your POSITIVE feedback. Please do NOT leave negative or neutral feedback without any contact. If you haven't received item in 30 days, please contact us and we will arrange refund or resend.